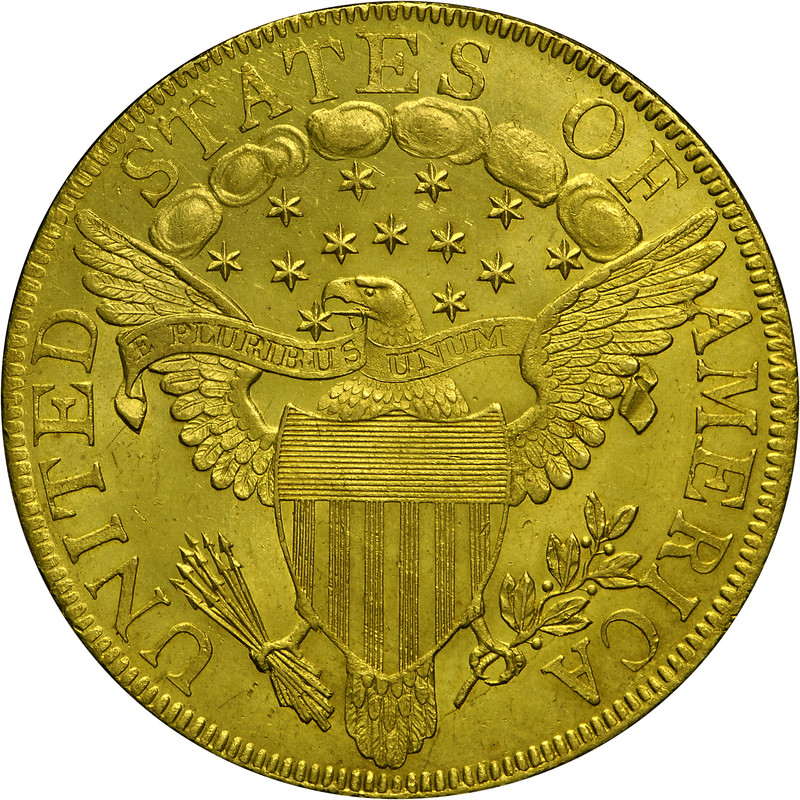 Just a single die marriage is known for the 1800-dated eagles. It was long believed that this was a rare issue; however, more recent study indicates that it is more common than once assumed. Approximately 150 examples are known with a number of Mint-State survivors, including this Bass Collection coin. Die state evidence indicates that some 1800-dated coins were actually struck after the first 1801 eagles. This reverse die was used for eagles dated 1799, 1800, and 1801. Purchased from Julian Leidman, September 25, 1970. 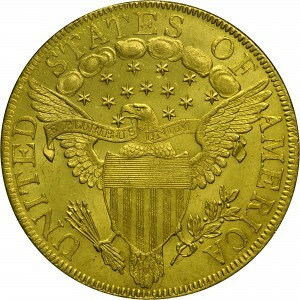 "Obverse: Large stars (as 1799, obverse 6). Star 7 markedly recut. L, R, and T recut over more slender letters, but not as deeply into die - resulting in a 'piggy-back' effect (not always visible). Cracks: edge to cap; light LIBE; heavier, edge above right side of B to ERTY. Rust lump above star 8. 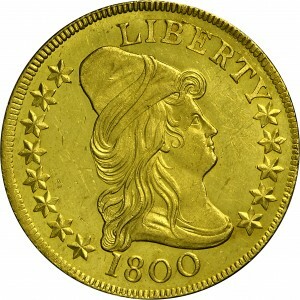 Reverse: That of 1799F. A(M) touches two feathers heavily (distinctive). Last berry centered under right foot of A. No weak stars. Space between clouds centered below E. Top right point of star 12 firmly grasped by both upper and lower beak. Shield has no spines at its upper corners. Crack, field beneath R, tip of top outside leaf, berry, next leaves pair, lowest berry, talon, tip of branch, tail feathers, arrow butts. Another, lower parts of UNI. Clash of obverse die's denticles evident thru tops of STAT."